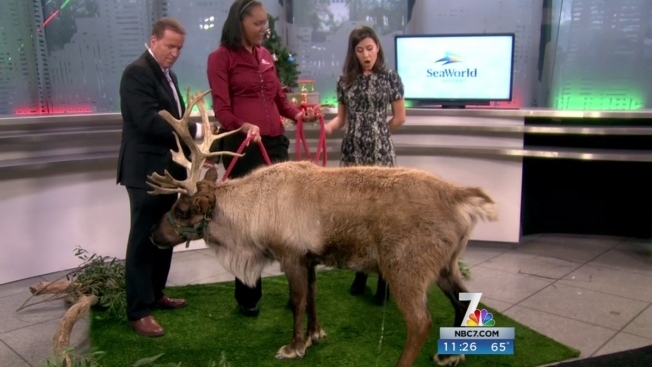 When a reindeer visited NBC 7 News Midday Friday, he surprised the station's anchors on live television as only an animal can. As soon as Megan Tevrizian and Jason Austell introduced Rudy and his animal ambassador Jen Miller, Rudy decided it was time to relieve himself in the San Diego studio. Miller didn't miss a beat saying, "Right on cue. All this wonderful food that he's eating." She then moved the conversation along to talk about SeaWorld's Christmas celebration being open until Jan. 3. As for Rudy, he didn't seem fazed at all. See the video embedded with this article. Mobile users can click here.